Architects don’t have hobbies, at least most of the ones I know don’t have one. I haven’t spent the time to do any real research, just basing this on what I know and from personal experience. So why don’t architects have hobbies? Inquiring minds like mine want to know. The “hobbies” that most architects participate in can hardly be called true hobbies, they are more extensions of what they do for a living. I like to take pictures, I like to travel, etc., etc. but those are somewhat job related activities. I don’t just take pictures, I take pictures of buildings … boooor-ringggg. Sure I like it and these are unpaid activities that I engage in on my own time but really? Those aren’t hobbies, not like sky-diving or stock car racing. What does it take to get something qualified as a hobby? Does there have to be a disconnect with what you do for a living? Does it have to be a frivolous use of your time? According to Merriam-Webster, a hobby is simply a pursuit outside one’s regular occupation engaged in especially for relaxation. That sounds like sleep and watching TV to me, which if I stop and think about it, I would like to pursuit those activities a little more than I currently am able to do. A couple of weekends ago, I spent my Saturday morning learning how to weld. I’m not sure that I would actually say I learned how to weld other than I was shown how to weld. 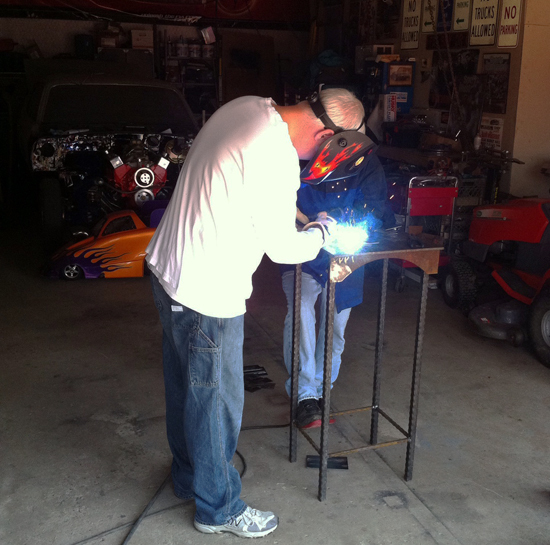 Within a few minutes of showing up, I had a GMAW – Gas Metal Arc Welder – in my hands and I was welding sh*t together. It was a lot of fun and I thought, could this be a hobby? I don’t actually need to know how to weld – there isn’t a MacGyver like scenario where I could avert some disaster if I only knew how to weld two pieces of plate steel together – so it definitely falls into the frivolous category. However, I can’t say that it was particularly relaxing … the opportunity to electrocute yourself exists and it wasn’t particularly comfortable wearing heavy clothing in a closed-in garage during a Texas summer. So why did I do it? Pretty simple really, I always thought welding was cool and I wanted to learn how to do it. Call it an intellectual pursuit if you want, and despite the potential to damage myself, I enjoyed it immensely. I wouldn’t expect anyone to recognize the welder in the camouflage pants and full yellow apron up above but that’s frequent Life of an Architect contributor Scott Taylor. He came along with me to this welding class and despite the fact that he had all new, immaculately clean gear on, Scott is a natural welder and put the rest of us to shame. Scott picked up a small TIG welder and aforementioned gear for Christmas this last year and while he hasn’t welded anything yet, I’m sure all his friends can expect to find some metal bookends in their very near future. But back to the original point and question – why don’t architects have hobbies? I used to bar-b-que until I killed my smoker (another story for a different day) but other than that – pffftt – nothing. Even this blog started off as a hobby but I certainly don’t consider it one now. It’s like writing 7th grade “What I did this summer” essay’s 3 time a week for 2 years. I think we all need to have some sort of hobby – some sort of distraction from our daily grind, an activity that is pursued just for pleasure or amusement. That has to be good for a person, I would imagine that there is evidence that it would probably extend your life … and that sounds like a very good reason to find and actually participate in a hobby. Like I said before, I need a hobby and most likely, so do you.